Most Brits are probably aware that England are currently battling Australia at cricket for possession of ‘The Ashes’. Twitter recorded high volumes of Tweets about cricket during the last Test match, particularly during the very close finish. With an interest in all aspects of social media, in cricket as well as snowsports, we’ve been following two very different Twitter campaigns designed to engage fans and promote the relevant brands. The first and best comes from Pedigree – ‘the official beer of England’. It’s very clear what users have to do to enter: simple send a witty tweet and include the hashtag #pedigreebanter. 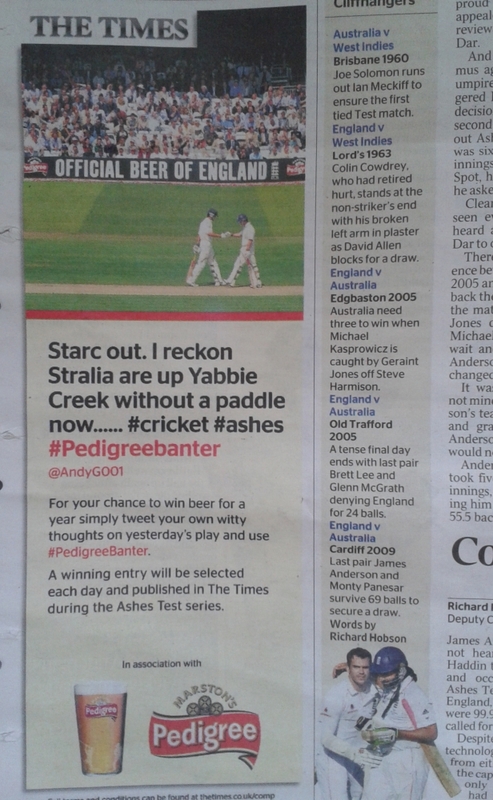 There’s a great prize – free beer for a year, plus your tweet printed in the Times. It also ties in with the brand: ‘banter’ becomes more likely after a few pints of Pedigree (and record amounts were sold during the last test). 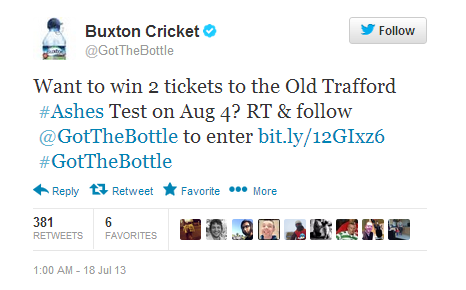 Buxton bottled water is another brand running a Twitter promotion around the Ashes. 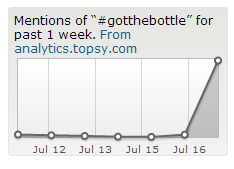 Like Pedigree, users have to send a Tweet containing the hashtag #gotthebottle. Tweets might also appear in print, although there’s no prize to win. Their ‘sponsored feature’ includes editorial about the day, most of which is already detailed in the paper’s coverage. The only new information that can’t be found elsewhere is an ‘On this day…’ feature, which carries the wrong date! (It relates to 1985, not 1945). A quick look at Topsy shows that last week #pedigreebanter was more successful, recording 13% more uses of the hashtag than the #gotthebottle campaign. However, today Buxton launched a competition to win two tickets to the next Test match. Within a few hours they had 380 Retweets and increased their hashtag use exponentially.